You deserve to be recognized for your effort in 2016! 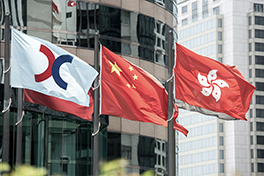 The launch of Shenzhen-Hong Kong Stock Connect on 5 December 2016 has aroused increasing market attention of Mainland investors on the Hong Kong market. The 3rd IR Awards will soon be launching around the Chinese New Year. Stay tuned with all our updates! "Yay" to 2017 and "Phew" to 2016! To many local IR elites, last year might probably have been a challenging time during the economic downturn. The new requirement of ESG report, continuous investor meetings and travels, and the expanding pool of investors from Mainland China for Stock Connect eligible stocks all made 2016 a very busy year. We see your effort, and we know you deserve to be recognized for it! 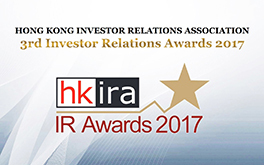 In the past two years, HKIRA cheered for the best practices of IR leaders for their team and their work in the annual Investor Relations Awards. The 3rd IR Awards 2017 is soon to be launched. This year, we will be introducing new award categories, to better and fairly honor the excellence of IR in various aspects. 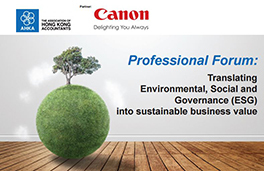 We invite you and everyone, including all listco, service providers, as well as domestic and international investment community, to join us for nomination of Hong Kong-listed companies and the local IR professionals who have been devoted to perform the best in investor relations in all aspects. Geert Peeters shared his experience of IR communication as Executive Director & CFO in CLP. Panel discussion on ESG moderated by Angus Guthrie of CLP (left), with Priscilla Luk of S&P (center) and Eric Yau of Link REIT (right). The Investor Relations Symposium jointly organized by HKIRA & HKEX for the forth time has become an annual sought-after event for IR industry. HKIRA is pleased the IR Symposium 2016 successfully gathered over 200 IROs, corporate executives and industry professionals attended. Themed "The Key of Communication" this year, elite speakers shared their experience in communication with internal C-levels managements, addressing ESG issues, facing Stock Connect potential investors, and across media platforms. The afternoon had been a meaningful learning experience. Special thanks to our sponsors CLP, Link REIT and Edico. Presentation materials are available for members on the event webpage. HKIRA was pleased to recognize 6 Fellows of 2016 during the IR Symposium, witnessed by nearly 200 professionals, on 12 December 2016. If you've been HKIRA member for over 3 years, consider becoming a Fellow now! Apply or renew HKIRA membership and you can enjoy many benefits, such as priority seating to all our events, exclusive access to presentation materials, and more. For existing members, renew your membership a month prior to the expiry date to receive a free admission coupon, good for members luncheon and seminars. Ask us about it! Individual Fellows and Members are awarded the designation of "HKIRA Fellow" and "HKIRA Member". You are encouraged to demonstrate best IR practices and let everyone know you are a member of HKIRA. 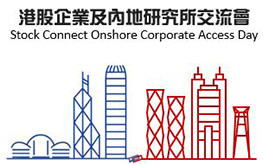 Stock Connect eligible ListCo's are encouraged to join and network with the leading mainland brokers! To know more details and register, please contact 2117 1846. 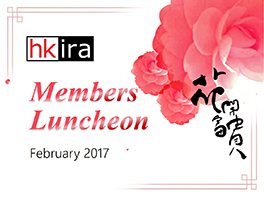 HKIRA members will enjoy 10 complimentary seats on a first-come-first-served basis and extra seats at HK$300 each. Get your complimentary seat now! Stay tuned for updates next week! 379 China Ever Grand Financial Leasing Group Co., Ltd.
762 China Unicom (Hong Kong) Ltd.
121 Group is hiring Key Account Manager (IR). For more details, visit our website. Posted since 9 Jan 2017.